I have a couple of students working with me for the summer, and this morning, one ambled up to my desk, then stopped in his tracks and said, “WHOA!! What IS that? 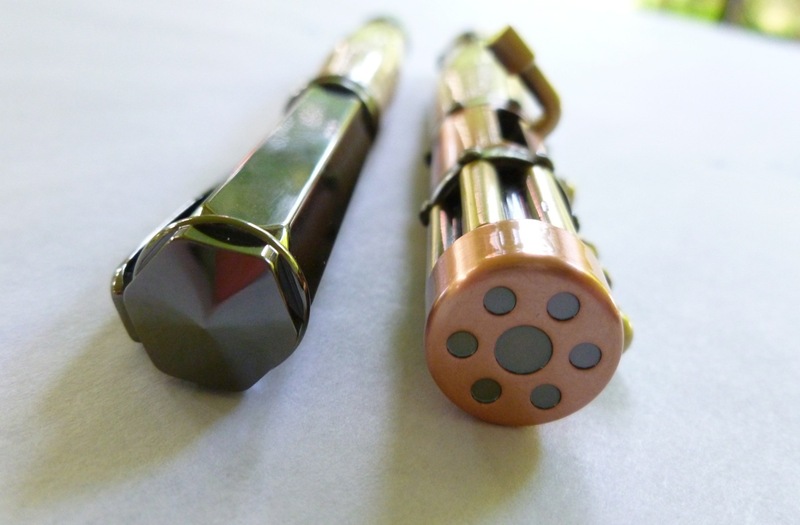 !” It’s not entirely obvious that it’s a pen, what with all of its steampunk accoutrements and all. But it is, it’s a pen. A big, heavy, outrageous pen. I backed and reviewed Amy Grigg’s first Kickstarter project, and since then, we’ve stayed in touch. Even though we’ve never met, I consider her a friend. She’s got that dry, spot-on sense of humor that makes her emails, letters, and Kickstarter updates a blast to read. I think she gets me, and I get her, so there was no way that I wasn’t going to back her second project. 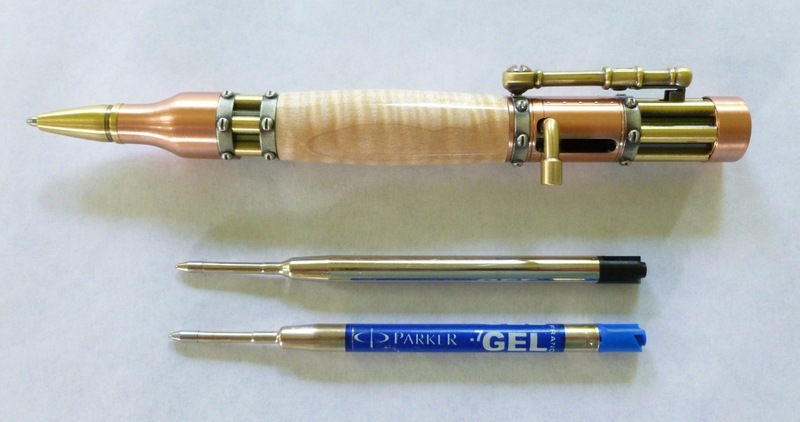 This time I backed two pens—the Outlier 2, a ballpoint/gel pen, and the Apex fountain pen—both made with curly maple. After I pledged, Amy sent me an email warning me about the size of the Outlier. (For the record, it’s 6″ long and weighs 72 grams. That’s big. That’s heavy.) She’s not a person to take your money and run. She wants you to be 100% happy with her work and your pens. She’s something of a Kickstarter anomaly in this regard. I assured her that I appreciated the heads-up, but that I had to go for it. This year has been a ridiculous one— what with the death of two pets, my ongoing medical journey, the assorted calamities of our elderly parents, etc.—so I wanted a ridiculous pen to mark the fact that we’re still standing (so far). The Outlier 2 is just that pen. 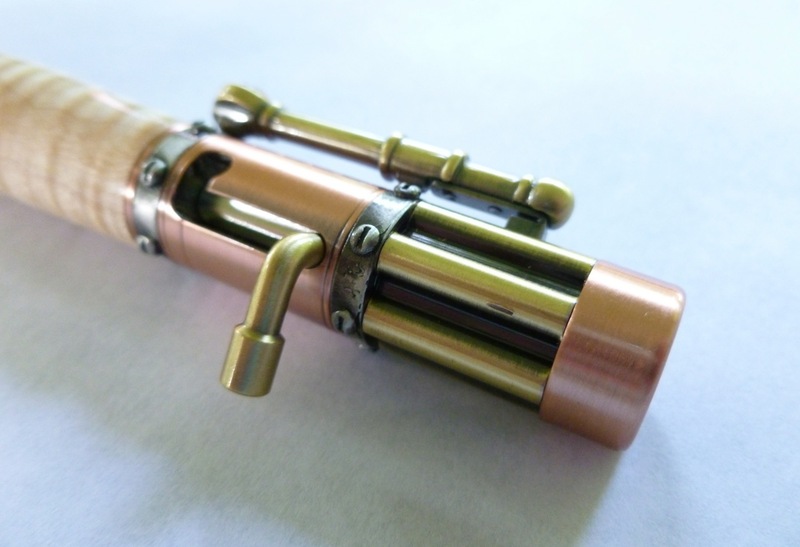 Its steampunk style stands out from the crowd in a big way. It’s dramatic and fantastic. Need to distract someone during a meeting? Use this pen. Need to defend yourself? I daresay that the Outlier could do that, too. It takes, and ships with, both a Parker style ballpoint refill and a gel refill, so you can customize the pen for your favorite writing style. I love the Schmidt EasyFlow 9000 ballpoint refill so that’s what I’ve installed in my Outlier. The line on that refill is as bold as the style of this pen. The refill deploys via a bolt action lever that’s works flawlessly and can be deployed easily with just your thumb. 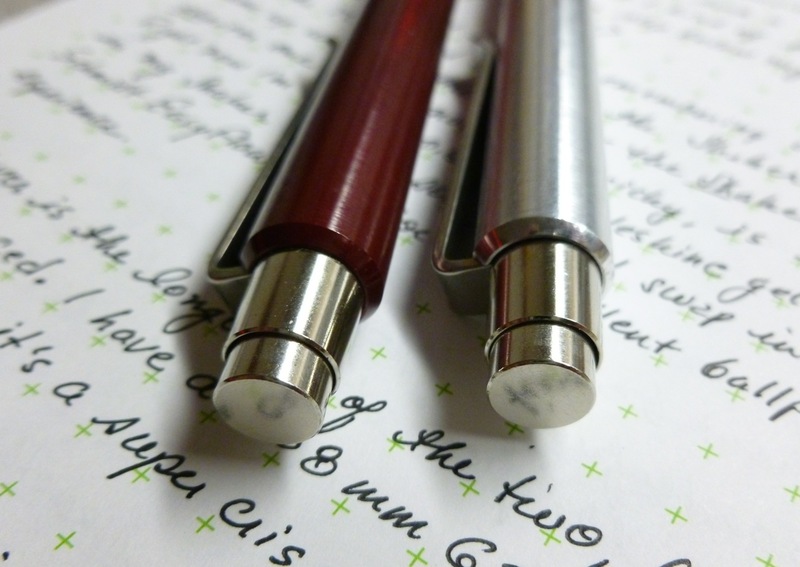 The Apex, available as a rollerball or fountain pen, is a much more practical pen. 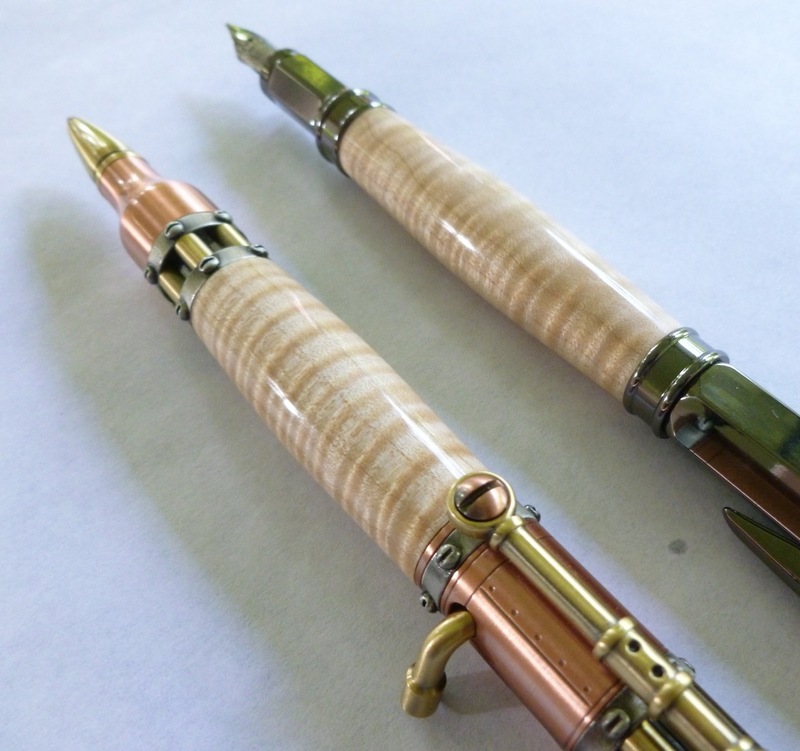 I backed the rollerball version the first time around, in dark cocobalo wood, so I decided to switch things up and opted for the fountain pen version in this fantastic curly maple wood. Amy raves about the curly maple on her project’s main page, and she’s right. It’s prettier in real life than I can capture with my camera, with interesting grain and depth. Amy’s woodworking skills and attention to detail transform raw wood into finished products—the pens here, but also bowls, boxes, and spoons—that are a joy to look at and hold. With gunmetal hardware, and a magnetic cap, this is a pen that’s as easy to use as it is to look at. The nib is generic, but wrote immediately upon inking, and lays down a smooth medium line. The pen ships with one international short cartridge and a converter. 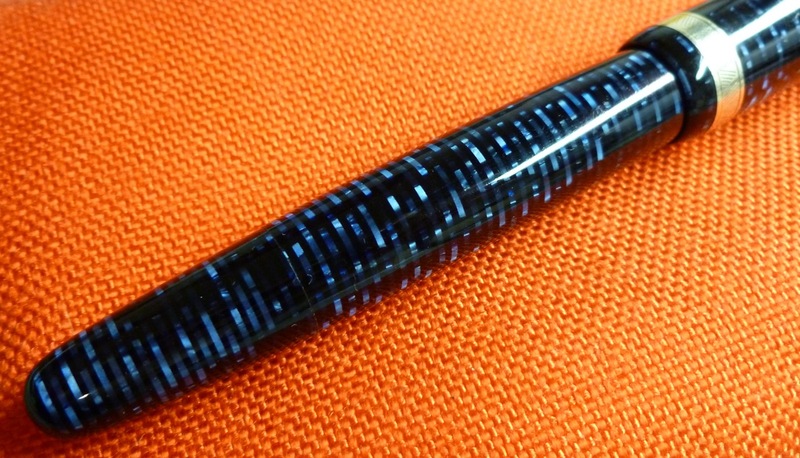 Mine is loaded with Sailor’s Yama Dori—a great looking ink for a cool looking pen. When you back a Kickstarter project, you’re backing a person as as much as you’re backing a product. There are very few people I’d back without hesitation, but Amy falls into this select group. Her updates are regular, honest, and entertaining. When an issue popped up with one of the woods in her last project, she got out in front of that and IMMEDIATELY laid out a series of options for the small group of affected backers. Even this issue was addressed with good humor and zero drama. Amy is authentic and the real deal—a woodworker committed to her craft and to your satisfaction. If you like what you see here, check out the full line of pens on her Kickstarter page. The project closes on July 16th so move quickly if you’re interested. There’s a little something there for everyone— from practical to deluxe offerings. All made with care, all made with 100% Amyness. Note: I backed Amy’s project with my own funds. My rewards were shipped to me early, but I was not required to review them, nor was I compensated in any way. I’ve been remiss. I should’ve reviewed these pens ages ago but they’ve become such staples in my daily pen arsenal that I let them slip below my pen review radar. The Mover and Shaker by Will Hodges, of Tactile Turn, deserve mention. I’ve always had a little trouble remembering which pen is the Mover and which is the Shaker. (Perhaps I should spend more time on Sudoku puzzles to keep my mind nimble.) Eventually I came up with a little trick—the Shaker is shorter, running 5.1″ (129 mm). SHaker = SHorter. Problem solved. The Shaker takes Parker style refills. Right now I’m using a Moleskine 0.5 mm gel refill, though I’ve been known to swap in a Schmidt EasyFlow 9000 for an excellent ballpoint experience. The Mover measures 5.5″ (141 mm), making it the longer of the two. Despite the added length, the pen remains very well balanced and is just as comfortable to hold as the squattier Shaker. I have 0.38 mm Pilot G2 refill in mine, which lays down a super crisp and consistent line. 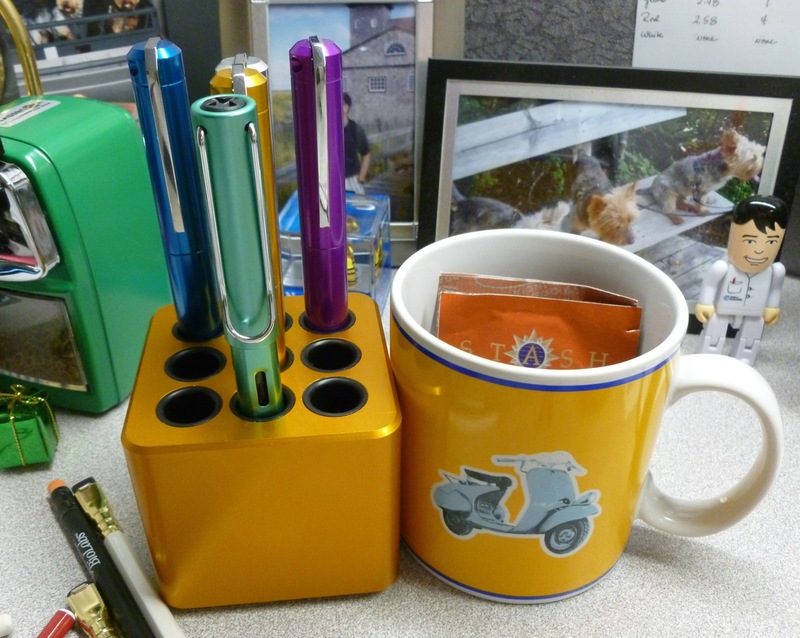 Both pens live in one of my “goes to work with me” Nock Co. pen cases and are used often. 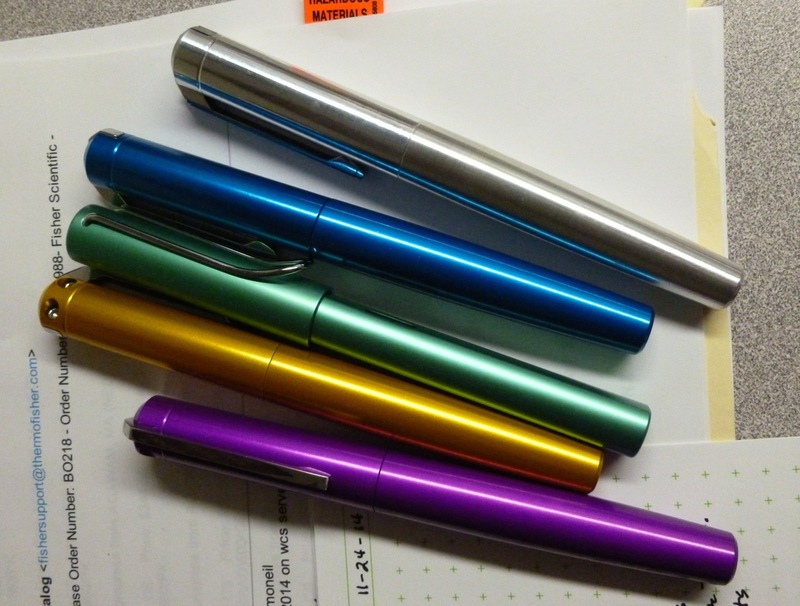 I remain enamored with Mike Bond’s Ti2 Techliner so that gets heavy use as well, but I do plenty of writing in and out of work, so it’s easy to give multiple pens a workout in the course of a day. I use both the Mover and Shaker in my Five Year journal as the fine tips allow me to squeeze sufficient detail into the day’s limited space. Will’s pens are solid and rattle-free. 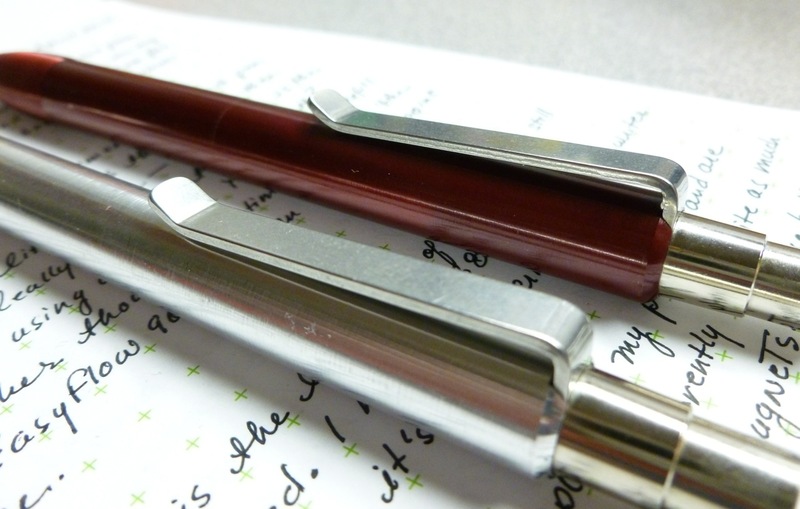 The “break” in the pen—where you twist the two halves apart to change the refill—is just about invisible. (See the photo above of as evidence.) The look is so seamless that I always have to remind myself where exactly the pens twist apart. The look is clean and tight. The knock is the silent variety, just like the one on the Karas Kustoms Retrakt. Since I’m a compulsive clicker, this features keeps co-workers from wanting to strangle me. The action is always smooth and trouble-free. Every click goes off without a hitch. The finely grooved grip areas— a stand-out feature on Will’s pens—look cool, feel great, and make for a wonderfully subtle slip-free writing experience. This grip area is the part of the pen that sets the Mover and Shaker apart from many other machined pens. 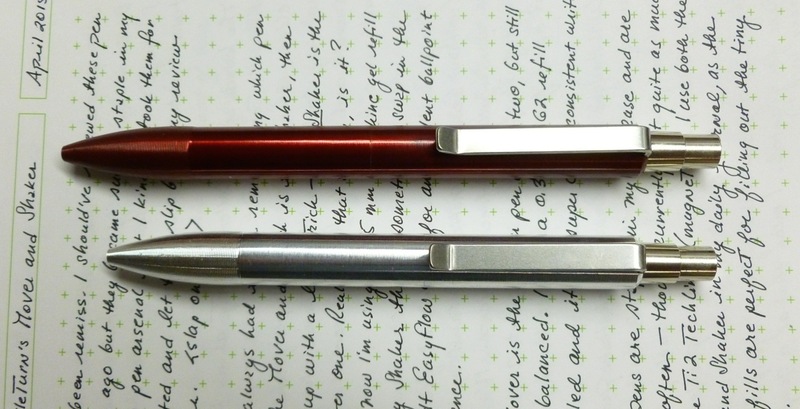 Will Hodges ran a smooth Kickstarter project and delivered a pair of solid, understated machined pens. They’re 100% reliable, very comfortable, totally solid and problem-free. The Mover and Shaker are so good that I found myself taking them for granted, and I TOTALLY mean that as a compliment. Some of the above has nothing whatsoever to do with pens (locale, dogs), but as Kickstarter gets bigger and bigger, it’s important to get to know who you’re dealing with. I’ve learned this the hard way, having backed a few projects that are dragging into eternity and a few that were outright scams. All pen makers are not equal. The more I can get to know someone, the better. Amy seems like the real deal. After I backed Amy’s project, she offered to expedite my reward (The Apex rollerball, $60 level) so that I could offer up a pen-in-hand review—good or bad. The pen arrived on the weekend and I’ve been making it part of my daily rotation since then, so that I can offer up some pictures and impressions. I don’t usually pay too much attention to packaging, but in this case, it’s worth a mention. 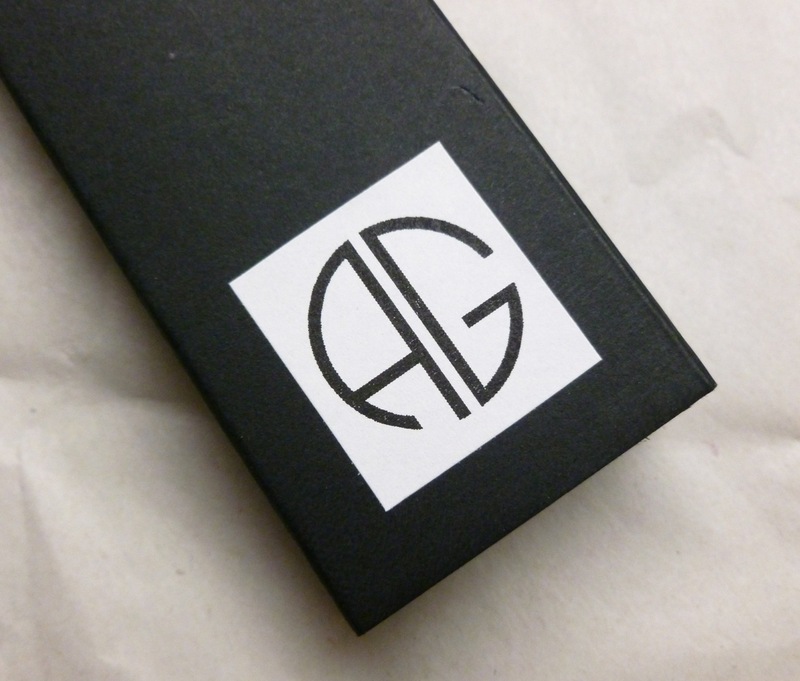 The black cardboard slip-case, adorned only with Amy’s logo, hits all the right notes for me. It’s minimalistic, but not a throw-away. Simple and understated, neither too much nor too little. I also like that you can get a glimpse of your pen through the small window. 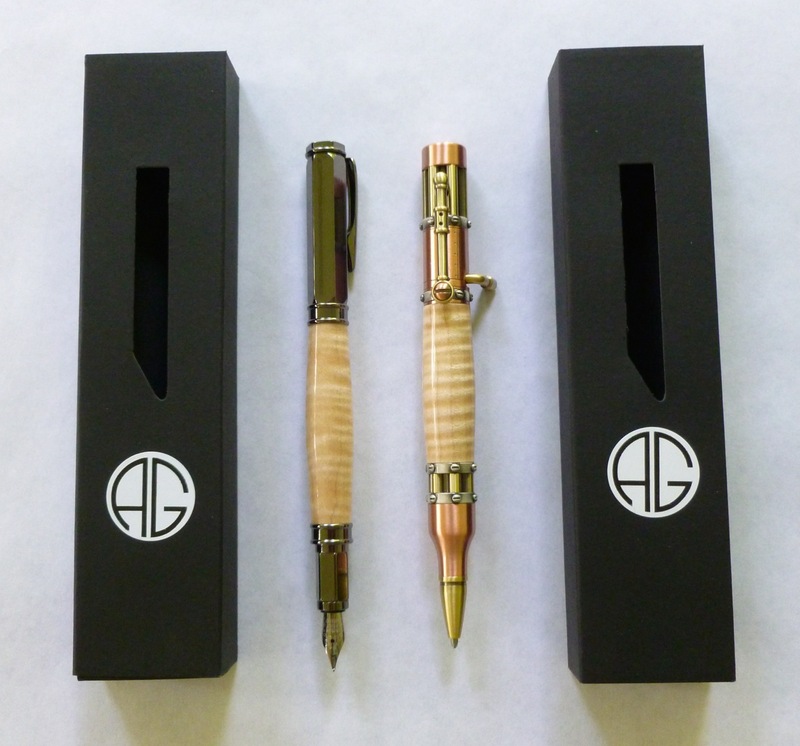 A self-employed woodworker by trade, Amy’s pens are crafted from exotic and domestic hardwoods. 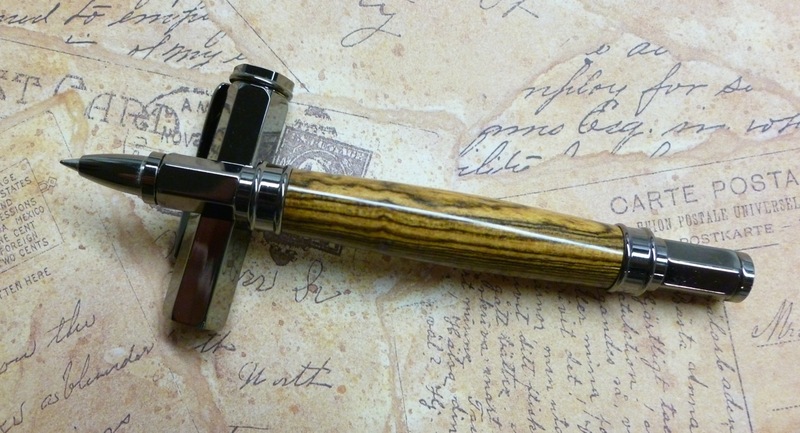 I chose Bocote wood for my Apex rollerball and love both the look and the feel. The gorgeously grained wood has been expertly turned and sealed for a silky smooth finish that’s pleasing to both the eye and the hand. It is, I repeat, SUPER smooth. This pen’s hardware sports a shiny gun-metal finish, and features a magnetic cap for exceptionally easy capping, uncapping, and posting. If there’s a magnetic feature in a pen, that’s usually the one I go for, so it’s really no surprise that I picked the Apex out of the handful of reward options. 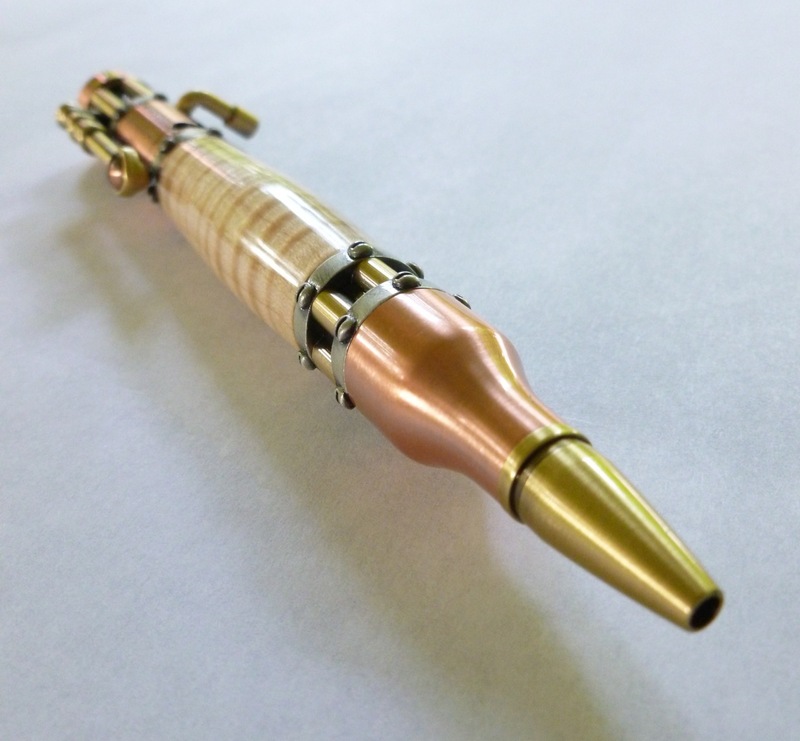 The hardware is purchased by Amy, who selects, turns, and finishes the wooden portion of the pen, and assembles the finished product. Everything in my pen is snug, solid, and good-looking. I particularly like that the wooden section of the Apex is thicker in the middle than at the two ends, which is a small detail that makes the Apex feel good in hand. 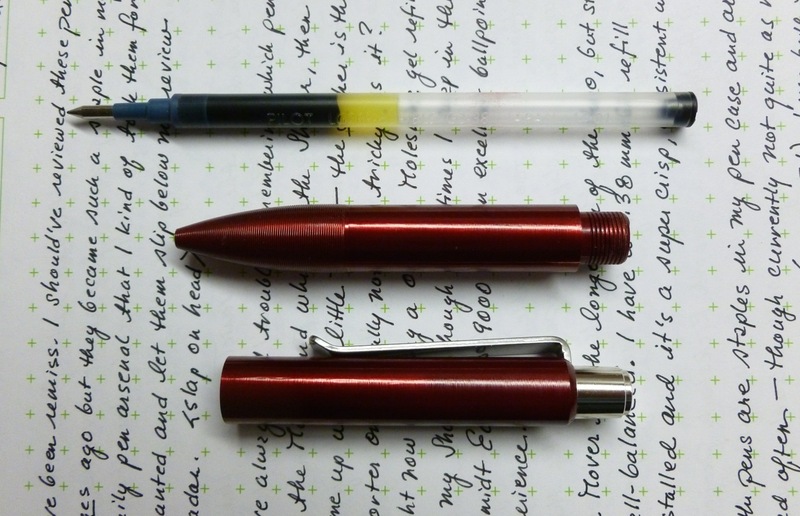 I tend to use the pen unposted as the weight of the cap (14.4 g) throws off the balance of the pen (31.4 g) a bit. Unposted, the balance is very good and the length is more than adequate (4.95″/126 mm). 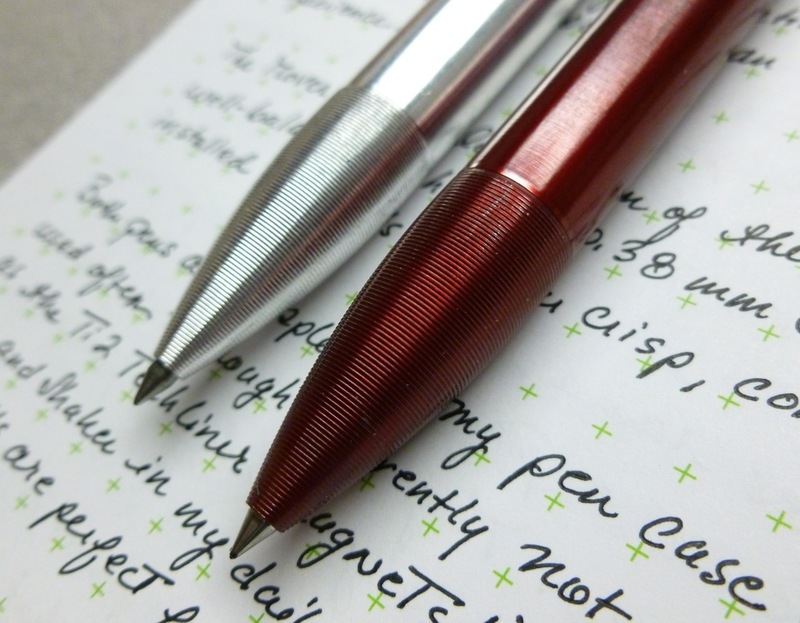 The pen measures 6.25″/159 mm when posted, which is usable, but feels a little long. 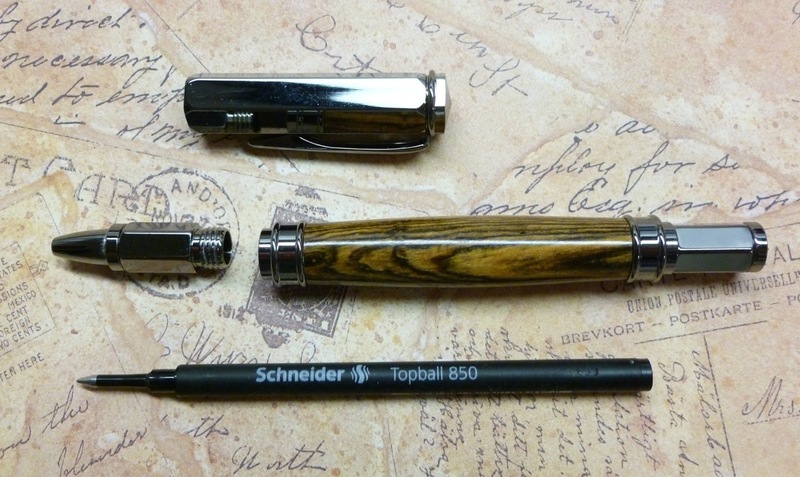 The Apex ships with the Schneider Topball 850 0.5mm refill, which is a refill that I use in a few of my other rollerball pens and quite enjoy. I believe the ink is liquid rather than gel, so the line is a touch wider than that of a comparably sized gel refill. The ceramic tip is not susceptible to drying out and is very smooth and consistent. 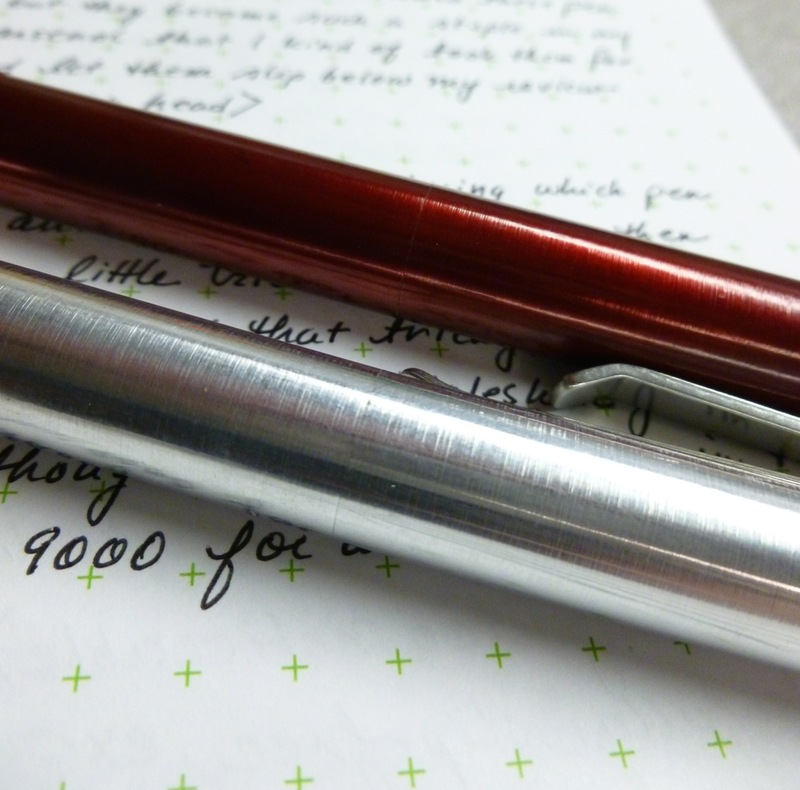 I love it on the Levenger Vivacious Circa paper I used for my rough draft of this review. If you prefer a gel ink, I’ve found that Staples house-brand Avant refills (0.5 mm gel) also work in this pen, so that’s an option. They’re normally on special for $1.00 for a pack of two refills (in store) so I keep plenty of those stocked in my refill “treasure chest” (which overfloweth). Amy’s project offers ballpoint, bolt-action ballpoint, rollerball, and fountain pen models with reward levels ranging from $40 to $280. 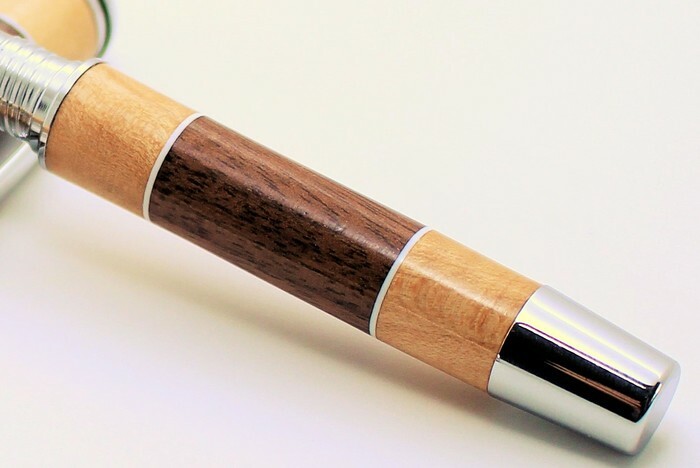 With twelve woods to choose from, you can create a personal pen that matches your style, in your favorite writing mode. Amy’s project campaign ends on April 20th, so move quickly if her pens and craftsmanship appeal to you. It’s been a joy to get to know both Amy and her pens, and I wish her well with this Kickstarter project and with her other creative endeavors. NOTE: As previously stated, the Apex pen reviewed here was purchased by me. I was not compensated for my review in any way. 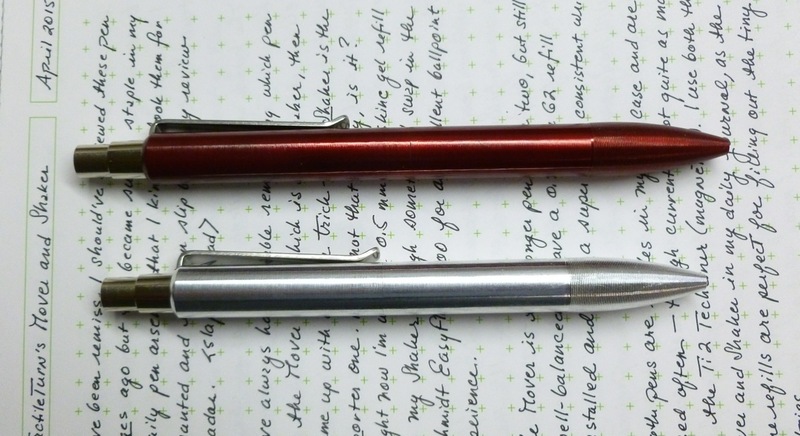 This review reflects my experiences with, and impressions of, the pen. 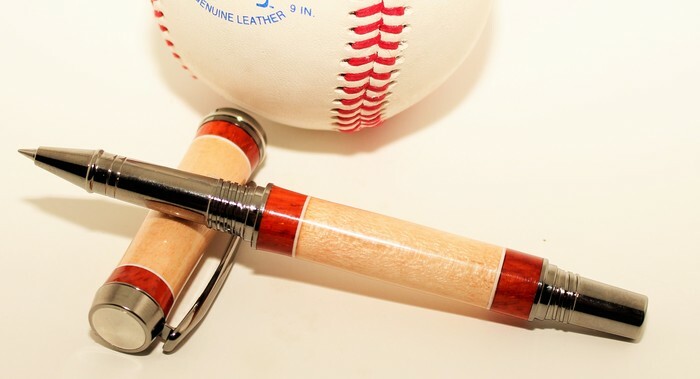 I haven’t been backing a lot of pen projects on Kickstarter lately, as per my desire to ratchet down the buying, BUT today I backed Doug Mann’s “Custom Handmade Pens” project. Doug hasn’t asked me to plug his project and I have no prior experience with Doug, so proceed as you see fit. I just thought this project was worth a quick mention. Doug’s from State College, PA and makes pens using traditional pen making processes combined with 3D printing technology. Interesting. 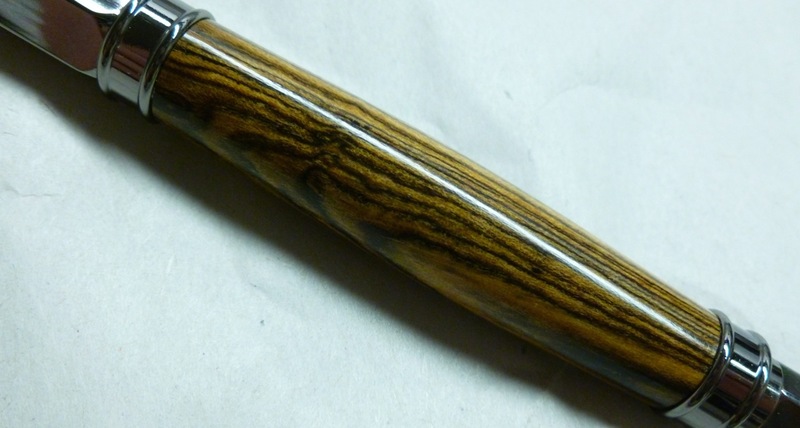 I like wooden pens, especially those with a bit of a story. 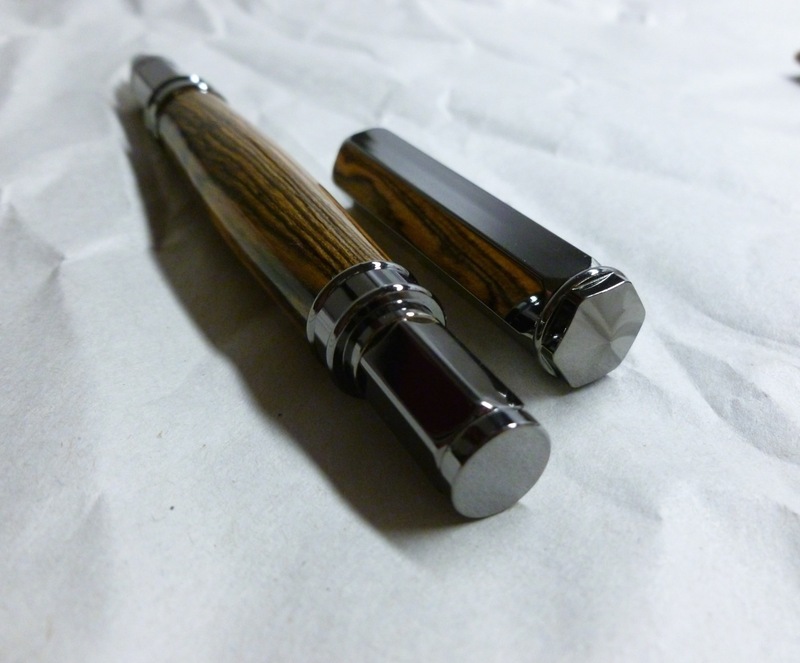 Doug is making rollerball and fountain pens available as rewards. Doug’s project certainly appears to be worth a look. Click HERE to do so. The CUBE (CU13E), a collaboration by KarasKustoms and Dudek Modern Goods, was sent to me for review purposes. I have not been, nor will I be, monetarily compensated. This review reflects my experiences and impressions. This thing is HOT. And heavy. Like a good romance. Which is apt, because I frickin’ love it. I love it because it solves a daily problem. I typically start the day with a pretty clear desk, then as the morning progresses, more and more pens find their way out of their cases and onto my desk. 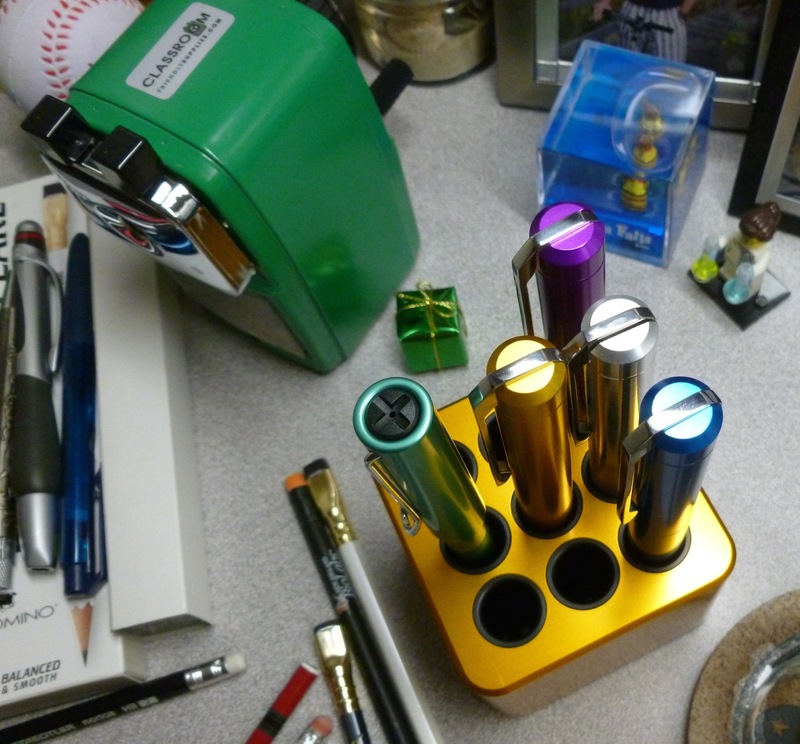 By late afternoon, pen clutter abounds. They’re banging into each other, hiding under papers, and sometimes (eek! ), falling on the floor. Shudder. 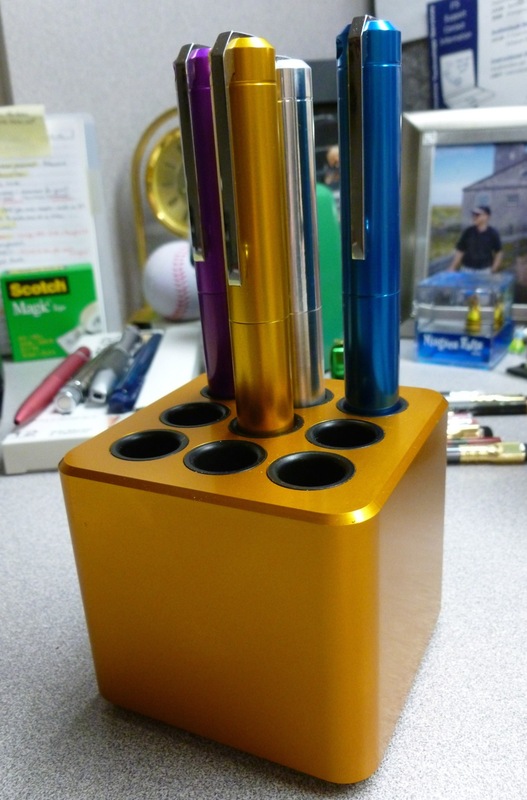 The solid aluminum CUBE solves that pen clutter problem, and does so with impeccable design, stunning good looks, and quality workmanship. A collaboration between KarasKustoms and Dudek Modern Goods, The CUBE arose from the chance friendship and complementary talents of Dan Bishop and Mike Dudek. Their Kickstarter video does a good job of showing how the idea for The CUBE was born. Donuts, it seems, played a big role in getting this collaboration off the ground. As I thought about this project, and Mike and Dan, another video idea popped into my head. Remember those Reese’s Peanut Butter Cup ads? The ones where two people are walking towards each other— one eating a chocolate bar and the other eating from a jar of peanut butter? They clumsily bump into each other and one says, “Hey- you got chocolate on my peanut butter! !” while the other one says, “You got peanut butter on my chocolate! !” Then they both take a taste of their accidental creation and smile big smiles as a wonderful new thing is discovered. 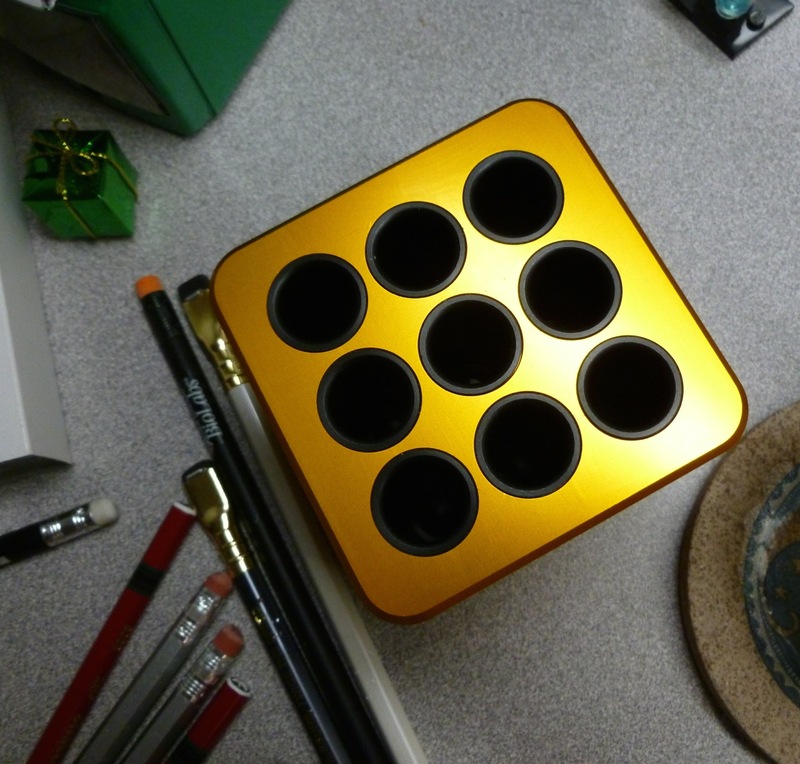 Some stats— The CUBE is solid aluminum and weighs in at nearly two pounds (1 lb, 14.4 oz). 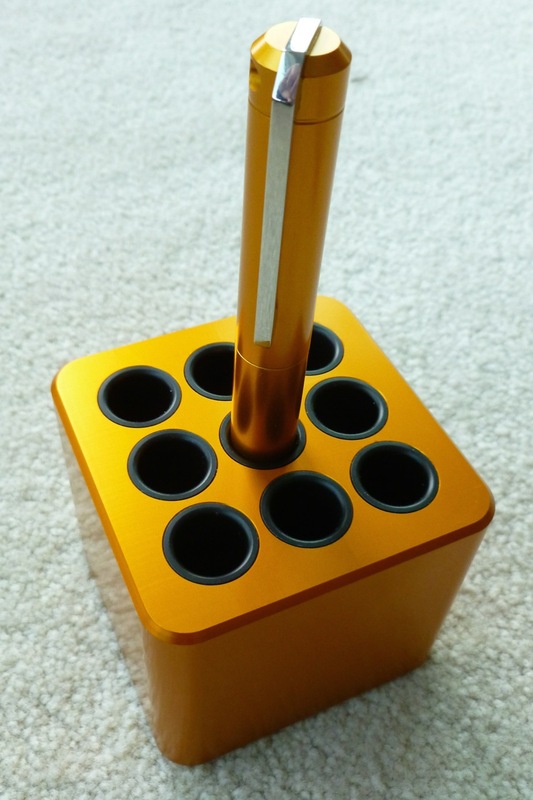 The nine holes, lined with pen-protecting Delrin, measure 0.563″ x 2″ deep. 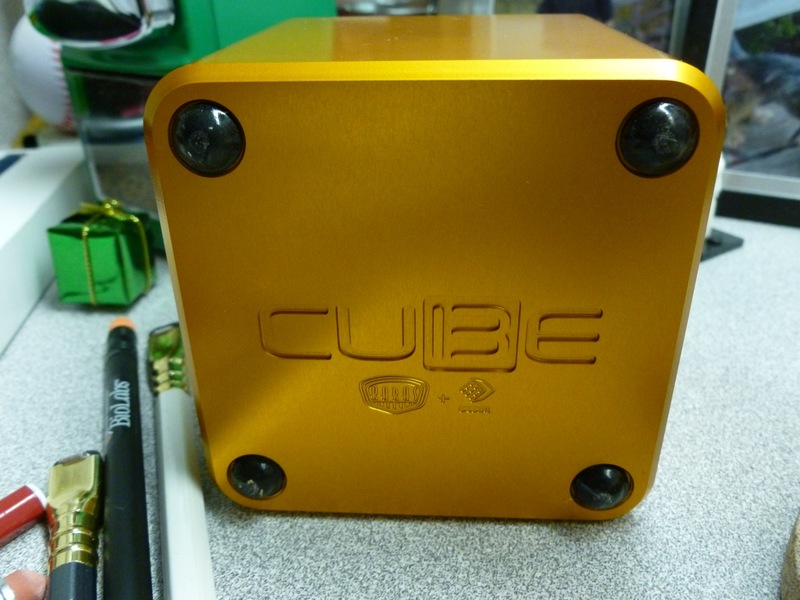 The CUBE itself measures 3.125″ x 3.125″ and is 2.750″ high (not including the height of the rubber feet). The rubber feet, a critical detail, protect your furniture and make The CUBE look like it’s levitating off of your desk. 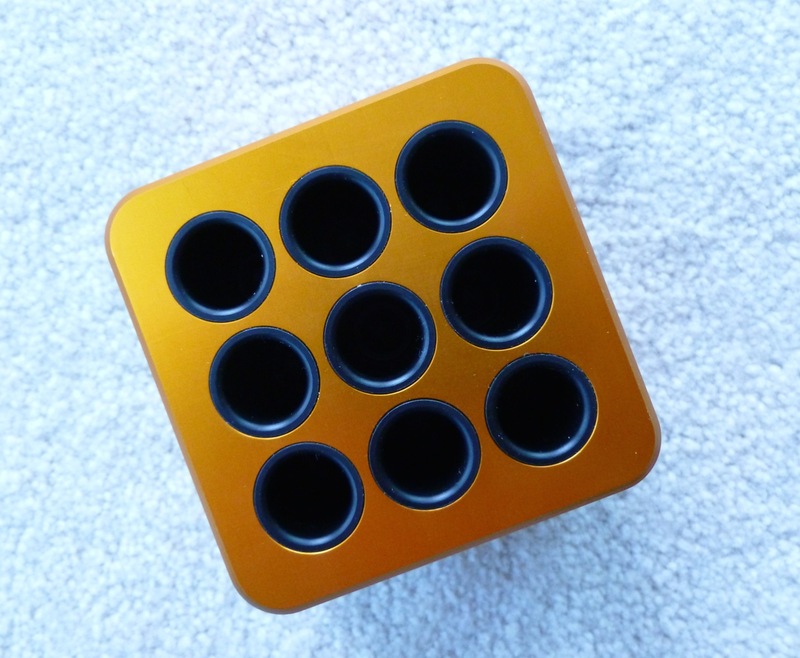 Available in silver (anodized aluminum), black, orange, blue, and red, The CUBE is a colorful and classy way to store your pens. I, apparently, have a thing for orange. Using Mike Dudek’s design and the mad machine skillz of KarasKustoms, this project is a testament to the talents of both parties. The CUBE is functional AND sculptural. It’s well-designed and well-executed. As I write this post, there are 15 days left in The CUBE’s Kickstarter campaign. The project was funded with super-sonic speed, a testament to the reputation of the two parties involved. Though I received this CUBE for review, I’ve also backed the project. That black CUBE is calling my name. Cool (and maybe free) stuff! 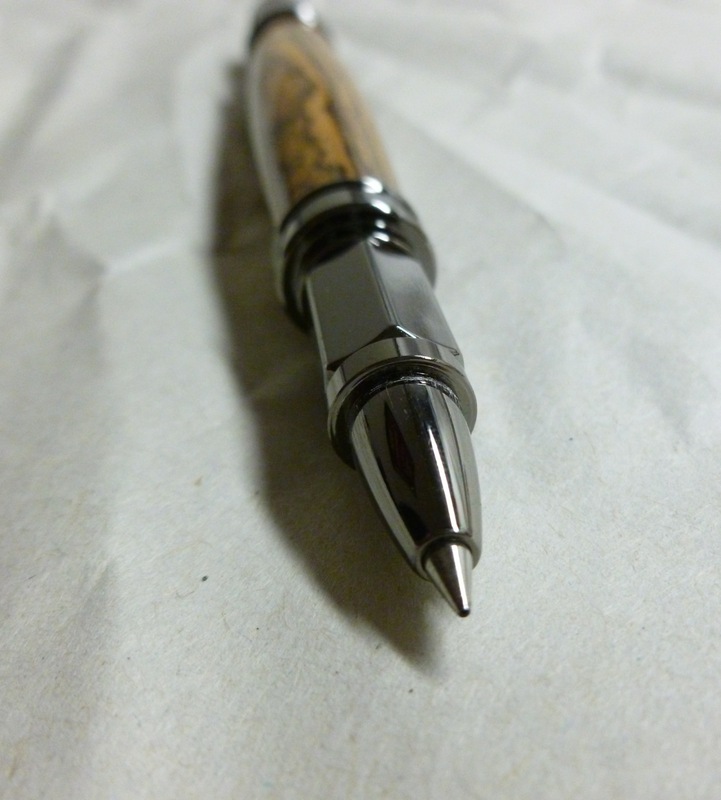 I find it hard to resist pen projects on Kickstarter, and have had generally very good experiences. Even though I’ve built up quite the supply of “Kickstarted” writing utensils, a couple of recent projects caught my eye AND my pledge. The project creators haven’t asked for a plug—I just wanted to share some cool stuff and a couple of giveaway opportunities. I wrote about the InTuition Pen/Stylus back in February, and continue to enjoy the look, feel, and performance of that pen. 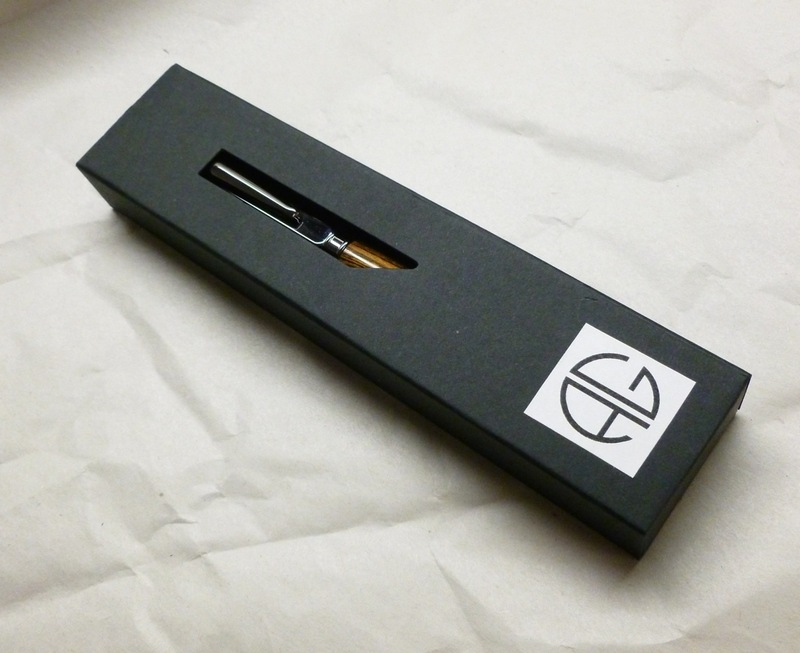 Now I see that Tom of e4 Labs has launched a companion project—the InTuition Pencil. More carbon fiber, more goodness. 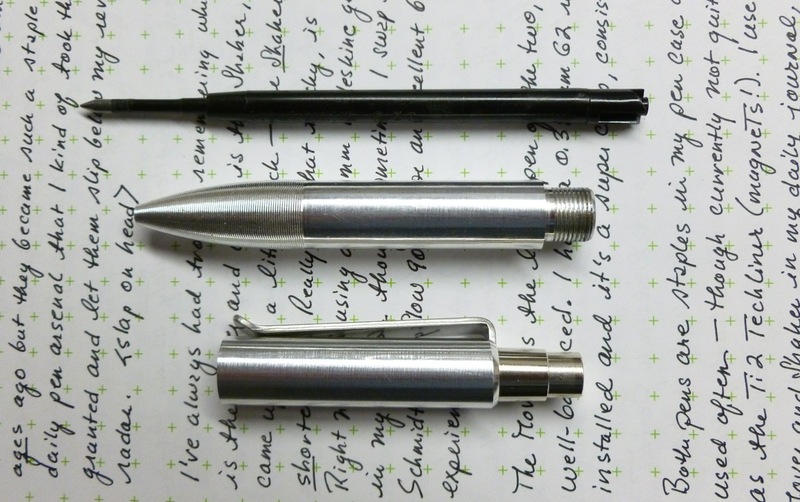 What I like about this project is that there are only a couple of backing tiers, one at $39 for one pencil (0.5, 0.7, or 0.9 mm lead size) and $110 for all three lead sizes. Only 300 rewards are available (now down to 224, at the time of this writing) for the single pencil while just 50 rewards (currently down to 43) are available for the trio of pencils. By capping the number of rewards at each level, Tom won’t suddenly be faced with an avalanche of orders that make his proposed timeline impossible to meet. Tom delivered a great product the last time and I have no reason to believe that this pencil project will be any different. I’m already looking forward to my 0.7 mm version. The funding period ends January 4th, 2014, and the project is currently about 34% funded. Let’s make it happen! Another Kickstarter project that made my eyes POP is the The Apollo Technical Pan and Drafting Scale by Pranay and Paul. Do I do any drafting? Heck no. Does that matter to me? Not at all. This thing is just so awesome looking that even my non-pen loving husband is excited. JetPens recently interviewed Pranay and Paul AND announced a JetPens/Apollo Pen giveaway contest. 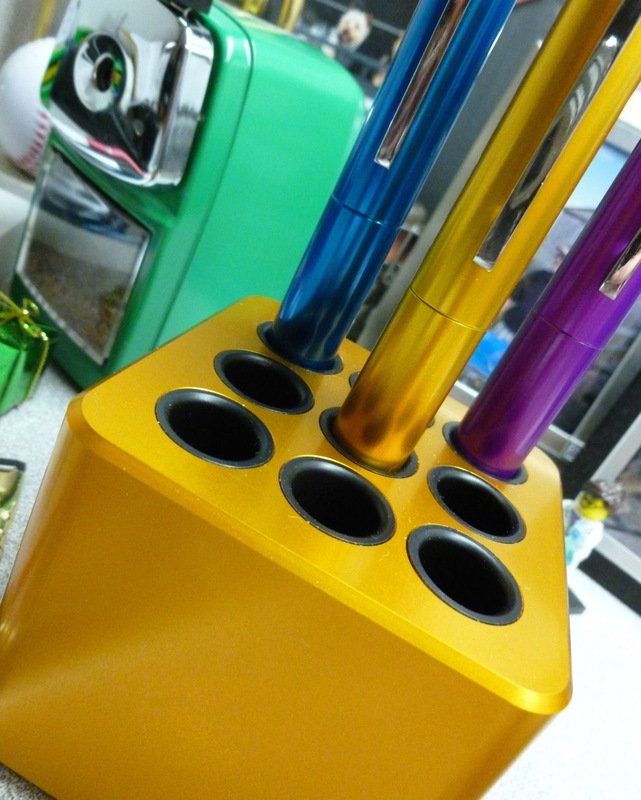 The grand prize is a JetPens themed Tri-Scale set with three pens, while one runner-up will receive a single Apollo pen. Check out their interview HERE. Enter the giveaway HERE. The contest ends December 12th. This Kickstarter project has six more days to go, and is almost 400% funded, so this one is a definite go. Can’t wait. The folks at Pen Chalet, a new-to-me online pen retailer, are currently running their own giveaway for $50, $25, and $10 dollar gift certificates. Who couldn’t use a little help with holiday spending, right? I spent some time browsing their site the other night, while entering the contest, and like what I see selection-wise AND price-wise. Definitely worth a look and an entry. A winner will be drawn on December 15th. Fingers crossed! Check out their contest HERE. 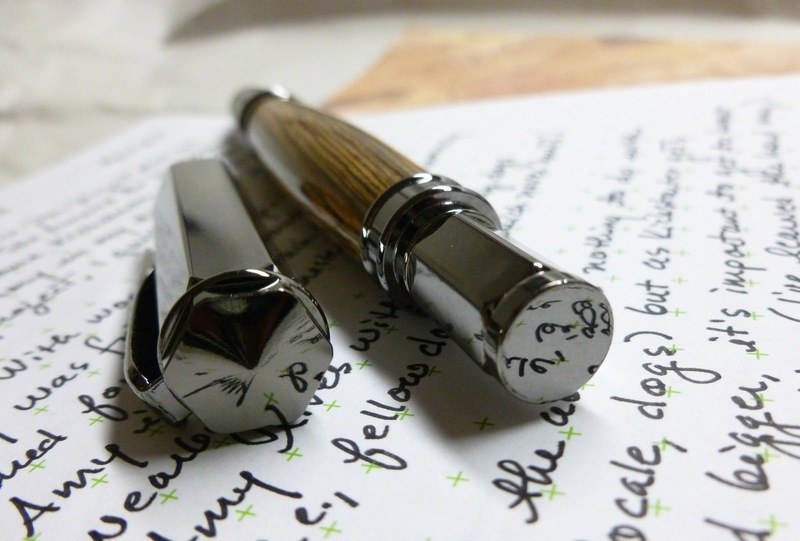 UPDATE: Here’s one more giveaway I JUST found— The FPGeeks are giving away a set of six Levenger inks and the True Writer Silver Anniversary Fountain Pen. What a sweet haul! Enter for those goodies HERE. This contest closes on January 6, 2014. Winning this would definitely make for a happy new year. Have a great weekend! I plan to spend a little time with some friends, then hunker down with some pens. Bliss. When I was at the DC Pen Show, I found myself completely overwhelmed and intimidated by the stunning array of vintage pens. I shied away from exploring them because I felt like I needed to know [much] more to be able to recognize an acceptable pen at a good price. Sarj Minhas has a staggering vintage collection (so nice that it paralyzed me, both physically and verbally). I was especially blown away by his “Ripley” Vacumatic— simply stunning— with a hefty price tag that I’m sure is well worth it. So, while in DC, I stuck to moderns and remain very pleased with those purchases. But gosh darn, those Vacumatics speak to me. And wouldn’t you know it— one popped up for sale on Dan Smith’s site. I slobbered over it, then had a bit of a twitter conversation with Dan before deciding to go for it. During this exchange, Dan asked me, “What is it about the Vacumatics that you like?” I quickly answered, “The stripey bits.” It really is that simple— I love the look of the striations (aka stripey bits). And at $65, I knew this would be a good “starter” Vacumatic. Going in, I was well aware that there are a few things wrong with the pen— and they’re undoubtedly big things if you’re a collector. 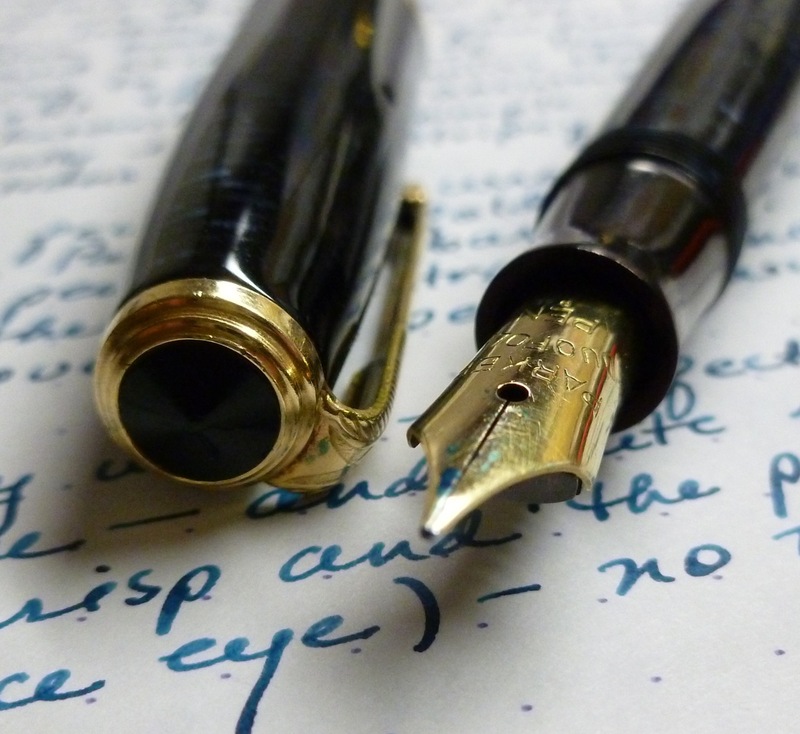 The nib is a Parker Duofold, which is the wrong nib for this pen. The barrel is badly ambered so that it’s not at all translucent. I’m not able to judge the ink level by looking at the barrel— it just stops writing. And I may or may not be having some filling issues (TBD; working with Anderson Pens on this…pretty sure it’s just me being impatient when filling). Despite all of this, I love this pen. LOVE. 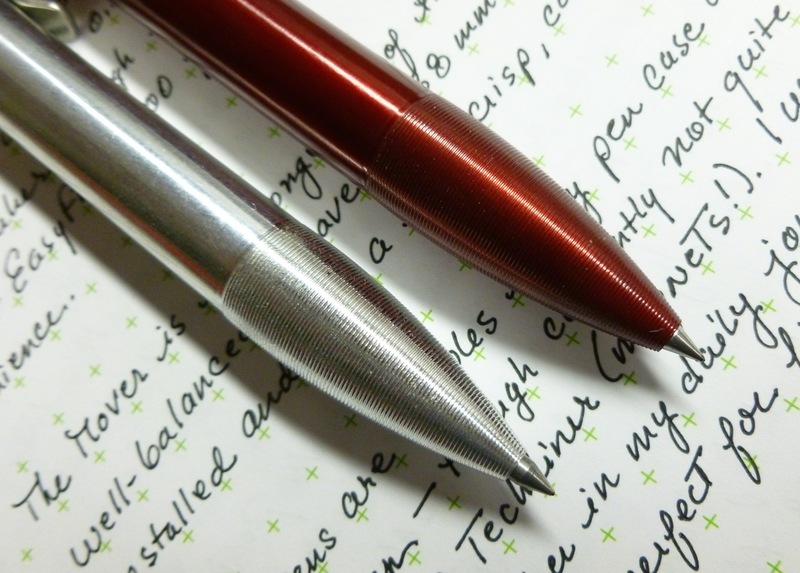 It puts down a perfectly wet, smooth, medium line— pure fun to write with. The barrel imprint is crisp and completely readable. The cap and clip are in great shape. Amazing, really, for a pen that was made in 1945. And those striations. Yeah, they’re what really got me. The filling system is very easy to use, but as I said, requires a bit of patience in that, according to Brian Anderson, one needs to pause at the bottom of the plunger’s downstroke, as well as at the top, for a second or two. I’m not sure that I’ve been doing that so my fills may have been a little short. Next time, I’ll take my time. Like so many pen lovers, I’ve been on the elusive hunt for the “perfect pen,” as if such a thing exists. Does perfect mean that it has to be expensive or super smoooooooth or drop-dead gorgeous, or does it just have to fit our hand or our tastes or our writing style? Heck if I know. I’m pretty sure, though, that “perfect” is a moving target. And maybe (undoubtedly) “perfect” is overrated. Our jobs/partners/kids/pets/churches/schools/movies/books/art are all imperfect— well-marbled with flaws along with the good stuff. And yet we love it all. We love our messy, sticky lives. 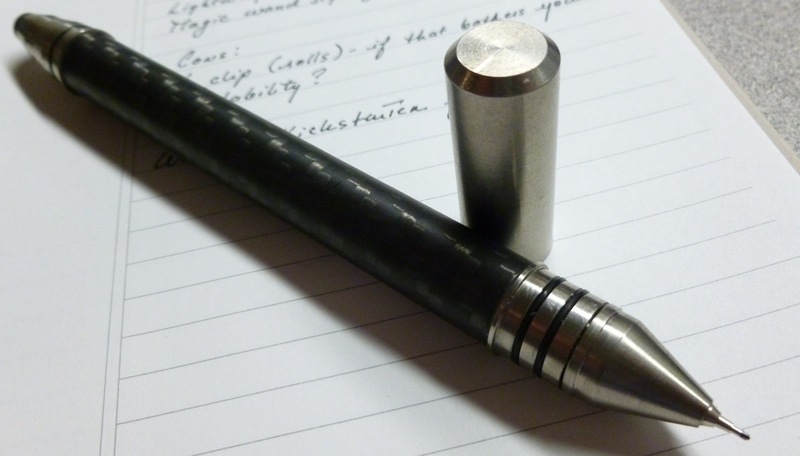 This pen is the same— flawed, and yet still wonderful. 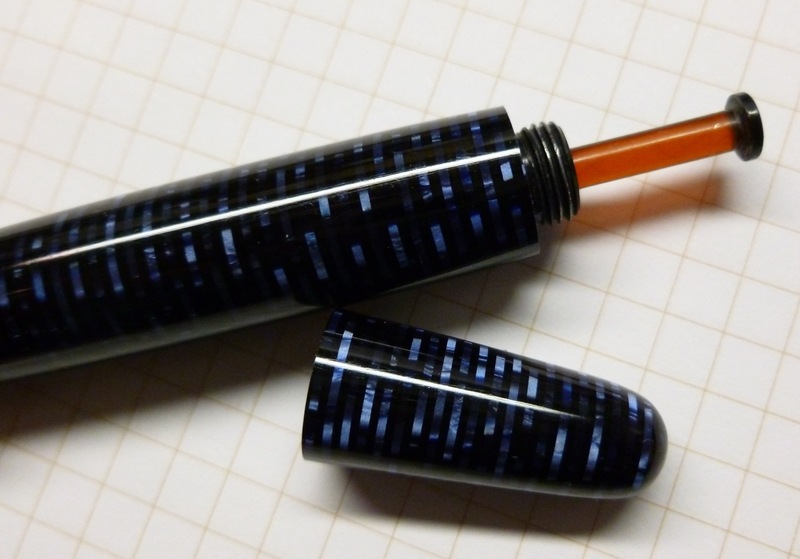 My Parker Vacumatic is currently inked with Pilot’s Iroshizuku tsuki-yo. The Sassafras pen case prototype by Nock Co. provided the colorful backdrop for a number of these photos, and is where I’ve been storing this Vacumatic. I’ve been carrying the Sassafras case with me EVERYWHERE and it looks as fresh as it did on day one. Check out Nock Co.’s project on Kickstarter.